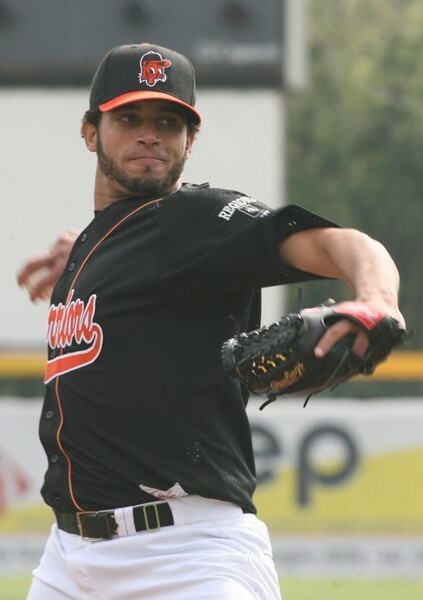 Right-handed pitcher Orlando Yntema, who celebrated his national team debut with the Netherlands during the 2010 Intercontinental Cup in Taiwan, is leaving the Italian Baseball League club Catania Warriors to join the promoted Dutch Hoofdklasse club UVV from Utrecht. The 24-year-old was born in the Dominican Republic, but has a Dutch passport. Yntema came to Europe last winter and had a 3-9 record with an ERA of 4.67 in 13 starts for the Warriors in 2010. He struck out 69 batters in 81 innings, while walking 49. At the Intercontinental Cup in Taiwan he was used as a reliever in three games, picking up the win in two of them. He gave up six hits, three runs (2 ER) and four walks in 6 2/3 innings overall against Italy, Thailand and Taiwan. Yntema is the latest acquisition to the UVV roster, which now should be complete looking forward to next year’s campaign. He is the third well-known new player on the team of new head coach Royce Holder besides Danny Rombley and Jurien van Zijl. The club from Utrecht returns to the Hoofdklasse for the first time since 1988.